On the eve of the first ever United Nations declared ‘International Day of Yoga’ on June 21, RIR spoke with Dr. Suresh Babu, practitioner of Hatha Yoga and Yoga teacher at Moscow’s Jawaharlal Nehru Cultural Centre. The eminent practitioner of Yoga has held master classes on various aspects of traditional Yoga practices across the Russian Federation. When did you come to Russia and start teaching yoga here? 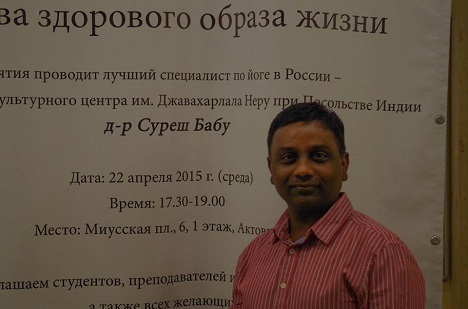 I came to Moscow in 2008 on the invitation of the Ministry of Culture and Indian Council of Cultural Relations (ICCR). Initially I came for a three year agreement. Then I had a two year break, when I had to work as an independent yoga teacher in Moscow. And again I was selected and posted in Moscow for three years. I studied two years as a biology student. Then, after the biology course, I decided to study naturopathy. So I got a degree of Bachelor of Naturopathy and Yogic Sciences (BNYS). Later I studied sports and physiotherapy as well. What groups do you teach? I have different groups; advanced, medium and beginner groups. On average, the size of a group is 15-20 people. I have different age groups. I recommend to people to start with yoga therapy classes if they have back pain or muscle pain, after 2-3 months they adjust, and I suggest that they visit regular classes. In summer I have fewer students because people go to the countryside or abroad. But in winter I have so many students, minimum 200-250 a month. What diseases can be prevented or helped by Yoga? Mostly, lifestyle diseases like back pain, diseases from sitting or standing for a long time, arthritis, muscle stiffness, joint stiffness. Nowadays stress is a part of our lives, you can’t avoid stress. But if your body has resistance you can minimise the stress-triggered problems. You should listen to your body. Back pain, neck pain, insomnia, some cardiac problems – these are all stress-triggered problems. Yoga can help to minimize the effect of these stress-related problems. Is yoga popular only in big cities or in smaller towns too? Nowadays, in most parts of Russia, in most big cities, yoga has become a part of daily activities of people. I gave yoga master classes in cities like Kazan, Ufa, Krasnodar and Tula, through the Embassy. Once you feel a taste of yoga, you can’t escape it. Yoga has a calming effect. In Russia most people practice Hatha yoga. I often combine elements of different yoga practices in my classes. Some people, like old people, can’t practice Hatha yoga and I give them breathing and meditation exercises, and some people prefer hard-core practices. Do you think there is a difference between Russian and Indian yoga teachers? Russian teachers mostly focus on Hatha yoga, do more asanas etc. Russians often have good flexibility and power. Being an Indian yoga teacher, I am more into teaching breathing and relaxation techniques. We do asanas too, it’s an integrated approach. Do you think it’s more difficult to Russians to do yoga because of the lifestyle differences? vegetarian or non-vegetarian. It helps to adapt to any kind of situation. For example, I came from India, and yoga helped me to adapt to the Russian climate. What do you think about the fact that June 21 will be celebrated as the International Yoga Day starting with this year? I think it’s a very good idea that June 21st has been proclaimed the International Yoga Day in Russia. It can help to create a healthy community. Now there are so many stress-related problems. Yoga is needed to overcome these problems. How can awareness of yoga be raised in Russia? Holding master classes in different Russian cities is a good way. We are doing it currently, trying to spread that awareness through the Embassy. I have known Dr. Suresh Babu for 6 or 7 years. Before that I have studied yoga at different centres. But these yoga classes at the Embassy are really my thing. When I leave the classes, I feel like flying. I am 50 years old, and I feel great. And I owe my good health and general well-being to yoga and to Dr. Suresh Babu. If ,for some reasons, I have to miss the classes, it isn’t good for my health. I came here 5 years ago and felt that yoga brought significant changes into my life. First of all, my health has improved a lot. But also there’ve been changes for the better in my life after that. I am ready to study under Dr. Suresh Babu’s guidance wherever he is, even if he goes to India, maybe I’ll find a way to visit and study. I told many friends of mine about these classes, and they joined them and are very happy. It’s true that in Russia there are not so many men doing yoga as women. But maybe it has something to do with the fact that yoga in many ways helps to stay young and beautiful for a longer time, and this is an additional attraction of yoga for Russians. As far as our classes are concerned, as a professor at Moscow State University, Department of Philology, I must say that Dr Suresh Babu’s classes are organised methodologically on a very high level. Being also a teacher but in a different sphere, I must say that it is very important for us to have systematic training. My colleagues and I are especially grateful to Dr. Suresh and to the Embassy for conducting these classes. I learnt about the classes by accident. I was looking for some healthy practice to improve the state of my health. I have been visiting these classes for 6 years approximately. I’d love to visit India. I hope that one day I’ll be able to go to a conference there on behalf of the university. I am planning to visit the International Day. This will be my first visit to this type of event with my colleagues, friends and our so to speak yoga community. I hope that more people will learn about yoga and will plunge into this boundless ocean. I’ve been interested in India for a long time, I can’t even explain why. Since I started doing yoga, my health has improved dramatically. It's easier to walk for me now, I stopped coughing, I don't have any inflammatory diseases and no more problems with breathing. Also, my working capacity has got much better. I can't even imagine my life without yoga. For me yoga is a hormonal development and a great mood booster. In October I will be 80 years old. But I am still feeling cheerful and energetic.